BACKGROUND AND PURPOSE: Diffusion-weighted MR imaging is generally acknowledged to be more sensitive in detecting acute stroke than is conventional MR imaging. Our purpose in the present study was to evaluate the utility of fast fluid-attenuated inversion recovery (FLAIR) MR imaging compared with that of diffusion-weighted MR imaging for the diagnosis of hyperacute stroke. METHODS: We reviewed patient records and cerebral MR images from all patients in a 13-month period from whom diffusion-weighted and fast-FLAIR imaging were obtained within 6 hours after symptom onset (n = 11). Special attention was paid to the presence or absence of arterial hyperintensity on FLAIR images and abnormally high-signal regions on diffusion-weighted images in the affected vascular territories. RESULTS: Arterial hyperintensity was found in eight of 11 patients, all of whom had embolic or thrombotic infarctions with middle cerebral arterial (MCA) distribution. Arterial hyperintensity was negative in the remaining three patients; the vascular territories were the posterior circulation region in two of these patients and the MCA region in one, and the types of infarction in these same patients were lacunar in two and embolic in one. Regions with high-signal diffusion abnormalities relevant to the patients' symptoms were found in 10 of 11 patients. One patient showed no diffusion abnormalities but the presence of arterial hyperintensity in the affected MCA territory on the initial MR examination, and manifested embolic infarction along with arterial hyperintensity on the initial FLAIR image. CONCLUSION: Although diffusion-weighted MR imaging is highly sensitive to stroke, diffusion-weighted MR imaging alone may not rule out a possible infarction. Arterial hyperintensity on FLAIR images can precede diffusion abnormalities and may provide a clue to the early detection of impending infarction. Diffusion-weighted MR imaging has been established as a reliable method for the detection of hyperacute stroke. According to some investigators (1, 2), diffusion-weighted MR imaging is highly accurate for diagnosing stroke within 6 hours of symptom onset. Gonzalez et al (1) reported that diffusion-weighted MR imaging has a sensitivity of 100% and a specificity of 100% in the diagnosis of early acute stroke in a cohort of 22 patients who were imaged within 6 hours of stroke symptom onset. Lovblad et al (2) reported that diffusion-weighted MR imaging showed a sensitivity of 94% and a specificity of 100% in the diagnosis of acute infarction for 48 patients within 6 hours of symptom onset. Although they concluded that the scans negative for stroke did not rule out an ischemic pathogenesis, they attributed false-negative diffusion-weighted findings to resolving symptomatic hypoperfusion, to small strokes below the spatial resolution of the technique, or to small brain stem stroke. More recently, it has been reported that several cases of hyperacute stroke showed an absence of changes on the initial diffusion changes, but follow-up images of the same patients showed relatively large infarctions in regions compatible with the clinical presentation (3, 4). These cases indicate that normal findings on diffusion-weighted images in patients with suspected cerebral ischemia do not rule out impending infarction. Investigators have reported that fast fluid-attenuated inversion recovery (FLAIR) MR imaging does not show the early temporal sensitivity of the diffusion sequence in stroke patients within 6 hours after onset (5). However, FLAIR reveals arterial hyperintensity in the affected vascular territory immediately after symptom onset, providing additional information for early diagnosis of impending infarction (6). In the present study, we reviewed diffusion-weighted and FLAIR images in stroke patients within 6 hours after symptom onset and evaluated the diagnostic value of arterial hyperintensity. We reviewed all cerebral MR images obtained between January 3, 1999 and February 10, 2000. During this period, emergency MR imaging was performed in 11 patients (seven men, four women; age range, 63–88 years; mean age, 74 years) within 6 hours of acute stroke symptom onset, and all of these patients eventually proved to have infarction at clinical follow-up. The time of imaging after onset in these 11 patients ranged from 1 hour to 6 hours (mean, 2.9 hours). All the patients underwent both echo-planar diffusion-weighted MR imaging and fast-FLAIR imaging at the time of the initial MR study. MR imaging was performed with a1.0-T whole-body imager with echo-planar capability. FLAIR images were obtained by using a fast-FLAIR sequence with the following parameters: 8000/110/1800/1 (TR/TEeff/TI/excitations); echo train length, 18; matrix, 256 × 192; section thickness, 6 mm; and intersection gap, 2 mm. Single-shot spin-echo echo-planar diffusion MR imaging was performed with the following parameters: 4999/126/1 (TR/TE/excitations), acquisition matrix, 128 × 128, section thickness, 6 mm; intersection gap, 2 mm. Diffusion gradients were sequentially activated in each of the three principal anatomic axes in order to obtain diffusion-weighted images sensitive to diffusion in the x, y, and z planes. Gradient strengths corresponding to b values at 1000 s/mm2 were used. Trace diffusion-weighted images were generated and used for clinical interpretation. Other MR sequences included axial T1-weighted (500/12/2) and axial fast spin-echo T2-weighted (4000/105/3, echo train length, 14) sequences. Contrast-enhanced T1-weighted (500/12/2) MR imaging was performed in four patients. The results of our study are summarized in the Table. Arterial hyperintensity was positive in eight of the 11 patients, all of whom had embolic or thrombotic infarctions with middle cerebral arterial (MCA) distribution. Arterial hyperintensity was seen along with areas of diffusion abnormalities in seven of the eight patients (Fig 1A, B, and D), but its extent was usually much smaller than that of the diffusion abnormalities. In one patient (case 11), arterial hyperintensity was present without diffusion abnormalities (Fig 2A–C). In four of the eight patients with arterial hyperintensity, contrast-enhanced MR imaging was also performed. Arterial enhancement was seen in all of these patients (Fig 1C). Arterial hyperintensity correlated with arterial enhancement, and it was found that the extent of arterial hyperintensity was smaller than that of the arterial enhancement in each case. Arterial hyperintensity was negative in three of the 11 patients. In these three patients, the vascular territories were the posterior circulation regions in two and the MCA regions in one, and the types of infarction were lacunar in two and embolic in one. Regions of diffusion abnormalities relevant to the patients' symptoms were found in 10 of the 11 patients. Thus, only one patient (case 11) showed an absence of diffusion abnormalities but the presence of arterial hyperintensity on the initial MR examination 3 hours after onset (Fig 2A–C). In this case, the presence of arterial hyperintensity was not found because of a subtle finding when the FLAIR image was first obtained. Therefore, the patient was thought to have had a transient ischemic attack, and was followed up conservatively. However, the patient's symptoms persisted for more than 48 hours, and follow-up MR study 3 days after onset revealed an infarction in the left parietal areas (Fig 2D and E). The patient received heparin beginning on the day of symptom onset, and he gradually improved during the 10 days later. Case 10. 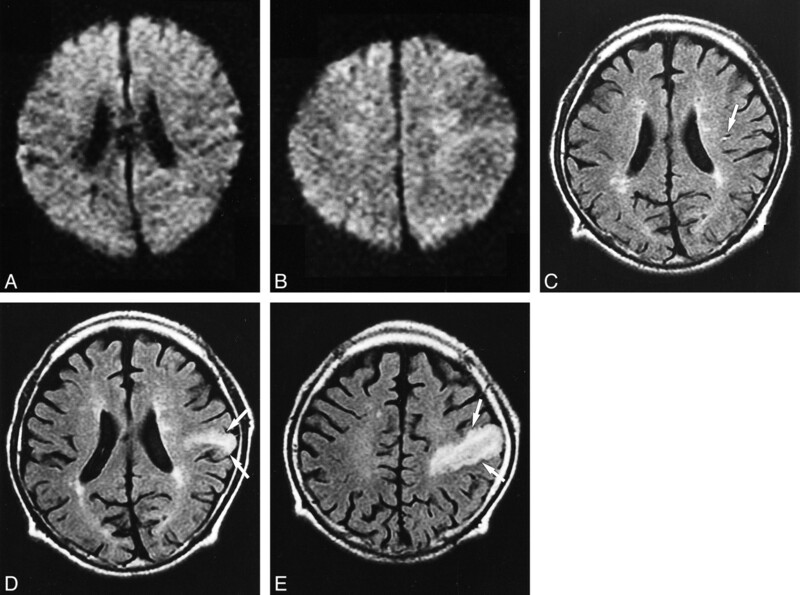 MR images of 75-year-old man, with right hemiparesis, scanned 3 hours (A–C) and 3 days (D) after symptom onset. A, Diffusion-weighted (4999/126/1, b = 1000) MR image shows high signal intensity in the left MCA territory (arrows), suggesting the infarction pertinent to this episode. B, Fast-FLAIR (8000/110/1, TI = 1800) image shows arterial hyperintensity in the left sylvian fissure (arrow). Note that there is chronic infarction that occurred 7 weeks before this stroke (arrowhead). C, Contrast-enhanced T1-weighted (500/12/2) image shows arterial enhancement more extensively than does the arterial hyperintensity exhibited in B (arrows). D, Fast-FLAIR (8000/110/1, TI = 1800) image shows a hyperintense area of acute infarction at 3 days after onset (arrowhead). Note that the arterial hyperintensity seen at 3 hours disappears at this time. Case 11. MR images of a 65-year-old man, with right-arm weakness, scanned 3 hours (A–C) and 3 days (D and E) after symptom onset. A and B, Diffusion-weighted MR images (4999/126/1, b = 1000) are negative for stroke 3 hours after onset. C, Fast-FLAIR (8000/110/1, TI = 1800) image shows arterial hyperintensity in the left MCA territory (arrow). This is the only abnormal finding pertinent to the patient's symptoms at the initial MR examination. D and E, Fast-FLAIR (8000/110/1, TI = 1800) images show extensive acute infarction in the left MCA territory 3 days after onset (arrows). Several previous investigators have reported that diffusion-weighted MR imaging is highly accurate for diagnosing stroke within 6 hours of symptom onset, and is superior to conventional MR imaging (1, 2). They have speculated that false-negative diffusion-weighted findings, if present, can be attributed to small lesions below the limits of scanning resolution or to resolving neurologic deficits. These reports suggest that findings negative for stroke on diffusion-weighted images may erroneously rule out impending infarction, and that such patients would therefore not be considered candidates for thrombolytic therapy. In our case (case 11), however, the initial diffusion-weighted images were negative for stroke, yet the patient eventually suffered extensive embolic infarction, suggesting that he should have been a candidate for thrombolytic treatment at the time of the initial MR examination. Arterial hyperintensity on FLAIR images is most frequently observed at an early stage of, and represents an early sign of, infarction (6, 7). Arterial hyperintensity seems to be associated with arterial enhancement on contrast-enhanced images because the areas of arterial hyperintensity are almost compatible with those of arterial enhancement, although arterial enhancement is usually more extensive than is arterial hyperintensity. It has been speculated that arterial slowing is the probable cause of arterial hyperintensity (6). According to Noguchi et al (6), angiography showed markedly slow retrograde filling of the insular, opercular, and cortical branches of the affected MCA from leptomeningeal anastomoses in a case of hyperacute infart with arterial hyperintensity of the insular and opercular branches of the affected MCA. These angiographic appearances are compatible with those reported in association with arterial enhancement in acute cerebral ischemia (8). 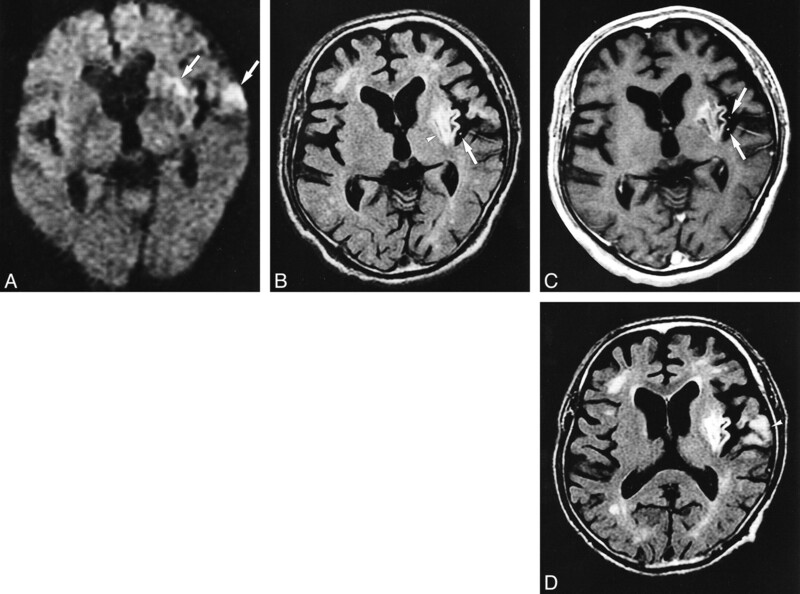 Arterial hyperintensity seen with acute stroke likely represents the phenomena that we have already observed with conventional MR imaging; the earliest MR changes showing loss of normal intravascular flow voids on T2-weighted and intermediate-weighted images (9), or the arterial enhancement after intravenous contrast material administration (8). However, a loss of flow voids may be very difficult to identify in the peripheral branch of the affected MCA. High-signal vessels surrounded by dark cerebrospinal fluid spaces are much easier to detect because normal vessels do not have high signal on FLAIR images. Arterial hyperintensity is usually less conspicuous and less extensive than is arterial enhancement, and may be a relatively inconspicuous finding, as in our series. We did not perform contrast-enhanced imaging in all cases. In general, however, it is not necessary to administer contrast material to assess a slow flow characteristic along the ischemic lesion, as acute infarction, if present, can usually be adequately determined using diffusion-weighted MR imaging (1). In case 11 reported on herein, however, we did not make a diagnosis of acute infarction because of a negative diffusion finding on the initial MR images, and arterial hyperintensity was overlooked on the initial FLAIR images. We emphasize that it is important to check for this subtly small finding when a patient presents clinically with symptoms suspicious for acute stroke. Arterial hyperintensity should not be mistaken for subarachnoid space hyperintensity on FLAIR images in the presence of subarachnoid space diseases such as subarachnoid hemorrhage and inflammatory or carcinomatous leptomeningeal processes (10). In such diseases, hyperintensity within the subarachnoid spaces is usually extensive or diffuse and does not stem from slow flow within the vessels, whereas arterial hyperintensity is focal and exhibits a tubular appearance. Although diffuse leptomeningeal hyperintensity can be seen in childhood moyamoya disease (11), similar to that in subarachnoid space diseases, the mechanism is probably due to a slow flow in the engorged pial arteries. It remains unknown why initial diffusion-weighted MR imaging may be falsely negative. Wang et al (4) have proposed three potential mechanisms that may explain the lack of diffusion changes in the acute phase in their two patients with proved eventual infarction. First, it is possible that cerebral blood flow was at an intermediate level, below the threshold for neuronal dysfunction (symptom onset) but above that of reduced diffusion. Second, diffusion changes may have been absent because reperfusion had occurred, restoring the diffusion constant to normal. In our case (case 11), the presence of arterial hyperintensity suggested the absence of reperfusion at the time of the initial MR examination. Third, a second ischemic event may have caused the eventual infarction; this, however, seems unlikely in our case because the patient's symptoms were already present at the time of the initial MR examination, and significant neurologic deterioration did not occur thereafter. Therefore, we believe that the first explanation is the likely mechanism in the current case, ie, the cerebral blood flow was not sufficiently low to cause reduced diffusion. Although diffusion-weighted MR imaging is highly sensitive to stroke within 6 hours after onset, a single case in our series with false-negative diffusion-weighted imaging findings emphasizes that diffusion-weighted MR imaging alone may not rule out possible impending infarction at the hyperacute stage. Although arterial hyperintensity is generally a subtle fining, it is frequently seen in embolic or thrombotic hyperacute infarction of the MCA territory. Arterial hyperintensity can precede diffusion abnormality and may provide a clue to the early detection of impending infarction. ↵1 Address reprint requests to Masayuki Maeda, MD, Department of Radiology, Mie University School of Medicine, 174 Edobashi, Tsu City, Mie 514-8507, Japan. Exclusion of brain lesions: is MR contrast medium required after a negative fluid-attenuated inversion recovery sequence?